Receiving a very welcome copy of this CD led me to wonder about the identity of the Irish traditional musician with the longest extant recording career and I suspect that the answer might be Peter/Peadar O’Loughlin or Bobby Gardiner, and if I’m wrong please send the correct answer to the usual address. 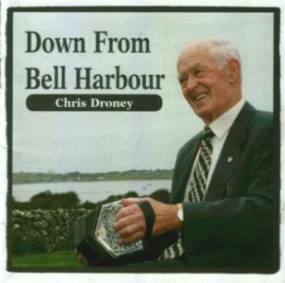 Whatever the case, it was 1962 when the concertina player Chris Droney, from Bell Harbour at almost the very northeastern tip of Clare, released his first album, Irish Dance Music. However, it wasn’t until 1975 that it’s successor, The Flowing Tide, hit the racks and another twenty years before The Fertile Rock appeared, a production rate which makes Noel Hill seem positively frenetic by comparison. By the early 1960s Chris’s name was very well-known in traditional music circles, thanks both to his victory in nine All-Ireland Senior Championships and membership of a variety of céilí bands (including the Kilfenora and the Aughrim Slopes) and, in latter years, he’s a long-serving member of the Four Courts Céilí Band. Chris must now be in his seventies, but, like his near contemporary Kitty Hayes, his music is still imbued with a sprightliness and a brightness of tone which belies his age. Down from Bell Harbour is a veritably grand mélange of tunes leaning heavily towards the reel as a key component (seven sets in all), plus an assortment of jigs (four sets) as well as a couple of hornpipes (including the very familiar The Home Ruler), a pair of waltzes and a self-composed air, Peaceful Corcomroe, named in honour of the ruined abbey just a short hop from Bell Harbour. Droney’s playing is ever tasteful , relatively uncluttered by ornamentation and thoroughly imbued by the spirit of the dance (as utterly exemplified by the elastic beat of The Knights of St Patrick jig). Many of the tunes have enjoyed a long currency in Clare, but there’s an essential element, perhaps an innate joie de vivre or an additional spring in the step, which sets Chris’s playing apart from the concertina players of the county’s southwest or east, particularly exemplified by the very sparse use of the bass buttons which suggest far less of an inherited piping influence. Accompaniment throughout is provided by Jacinta McEvoy (spouse of John and sister-in-law of Catherine) on piano and guitar and, apart from an occasional over-exhilarating bounce, is tastefully presented, not least on the aforementioned air – it certainly helps that Jacinta is a concertina player herself. However, this listener’s ears have become jaded over many years of hearing albums of accompanied solo instrumentalists and, admirable though Jacinta’s playing might be, there really is a need to let the lead instrument speak for itself. Chris is a superb musician so why not let us hear his music unadulterated for at least a couple of tracks? For more information about the label visit www.cic.ie.